MW11-MW41 and MW51-MW82 are mounted in pockets which can be moved by air pressure into the vacuum tube. The pockets have 100μm Ti or 150μm Fe windows on both sides. MW42 stands on air. In this case the gas volume is separated by 25μm kapton foils. Vacuum chamber of MWPC in the FRS beamline with radioactive source mounted at the out position (left upper corner looking downstream with the beam), where you can see the sticker. The MWPC has three grids. Anode (A), (G) and (T). Electrons are emitted from the gap around or the cathode material. Towards the thin anode wires the electron current is amplified by secondary electrons in an avalanche process. The gap is filled with a CO2 / Argon mixture. More details about the construction of the MWPC interior in this report by Michael Träger from the GSI Detector Lab (in German). In most cases the pockets have 100μm Ti windows on both sides, some have iron windows. MW42 stands on air in this case the gas volume is separated from the air by 25μm kapton foils. The details for each individual MWPC are written in the data sheets. The typical position resolution is about 0.5 mm and the detectors cover an area of 200mm * 200mm. Matter distribution of one MWPC. The values are given for the respective material as well as for an equivalent layer of aluminum. They correspond to the total number of layers or wire planes in one detector. The probability for hitting a cathode wire is 10% for one detector. The anode plane is ignored because hits on the anode wires are rather improbable (see next table). The pregap planes consist of a nickel-plated polyester mesh. The fibers have a thickness of 36 μm with a spacing to the next fiber of 50 μm, leading to a strong inhomogenity (rms d) of this layer. Geometry and material thickness of the wire planes. Given are the distances between the wires, the diameter and the material thickness at the thickest point for the wire materials as well as the thickness of an equivalent layer of aluminum. The values correspond to one wire plane. The anode wires are rotated by 45deg versus the cathode wires. For most applications with heavy ions only the anode voltage is used. For lighter ions (Z<6, Carbon) a pregap has to be used to amplify the number of electrons in the avalanche. When using the pregap the most important point in setting the detector high voltage is to make sure the pregap voltage is not too high, which leads to sparks and will eventually destroy the pregap. To prevent this, the voltage UT always has to be applied before the voltage UG is activated. As an additional precautionary measure, the C.A.E.N. high voltage system must be programmed such that the UG voltage is switched off immediately if an overcurrent occurs (parameter TRIP = 0) while the voltage UT should never trip at all (TRIP = 9999, see the C.A.E.N. manual in the pink FRS folder). If the voltage UA is too high, sparking can only occur when a strong beam is impinging on the detector. Even though this is not quite as harmful as a sparking pregap, the TRIP parameter for the UA channels should also be set to 0. When the pregap is used, even minimum-ionizing particles (e.g. anti-protons at 1 GeV/u) yield appropriate signal heights. For medium to very heavy ions, however, a rather strong signal is induced at the anode wire plane which leads to the formation of two pulses: A smaller primary one from the anode plane and a larger second one from the pregap avalanche, which is delayed by a drift time of about 550 ns. For nuclei above ~ Ar (Z=18), the anode voltage can not be lowered far enough to suppress the first signal entirely. In that case, the pregap should be switched off and the anode signal alone be used. Start with one detector, e.g. MW11, with a few hundred or so particles per spill. All high voltages should be zero. Connect the Anode signal as delivered to the FRS Messhütte to an oscilloscope (50 Ω DC, 200 ns/division). You should check for a preamp noise around 10 mV. If it's not there, check the preamp power supplies and the cables. Raise the UA voltage from 2 kV to about 2.5 kV in steps of 100 V. The signal, if any, should not exceed 5 V. If the signal exceeds the CFD threshold value for 2.5 kV, you do not need the pregap and can adjust the signal height with the anode high voltage alone. 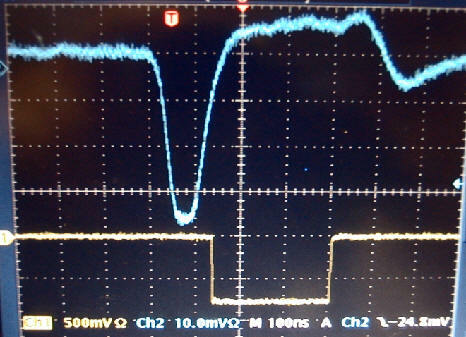 Signal of good MWPC with 90Sr beta source and +2500V on anode only. Blue the raw anode (200 mV, 40ns), yellow the output of the CFD. These values can only serve as guidelines. The voltage necessary can vary significantly between single detectors. As an example values for 200 MeV/u 238U from December 2003. Only the anode HV was used. The Preamplifiers are located directly at the flange with connectors to the MWPCs. the pulser entrance goes directly to the center of the delay lines. Block diagram of MWPC electronics. The anode or cathode signals go onto a constant fraction discriminator entrance voltage should be >100 mV and < 5V. Shorter delays are used for the anodes so they can be used as a trigger. The NIM signals go onto a VME TDC and into the RIO DAQ. 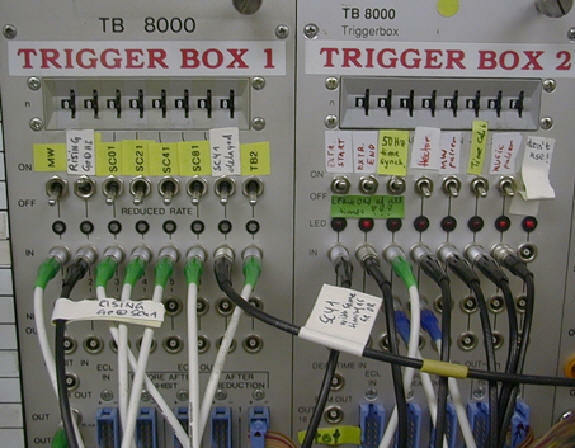 All anodes of the MWPCs can be used as trigger, select "MW" with the switch from trigger box 1 in the electronics rack and choose the number of the detector by selecting the proper multiplexer output (i.e. by clicking the MUX button in the Labview CFD control program on KP2PC123. Here also the CFD thresholds can be set for all anodes and cathodes (L, R, U, D), usual are -25mV. To start the program, login as profi (password ask FRS Expert) on KP2PC123, connect disk P: with \w2kfilesvb\gsi$gsiroot and go to directory P:\FRStools\Labview\Labview_projects\ESONE\ESONE_FRS\CF8102_Main and start "Verknüpfung mit CF8102_Main.vi". Hardware switches for trigger box 1 and 2. 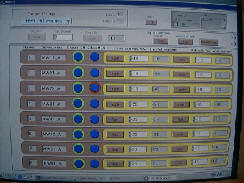 Selection of MUX channel with LabView program on KP2PC123. A pulser signal can be fed to the middle of the delay line. 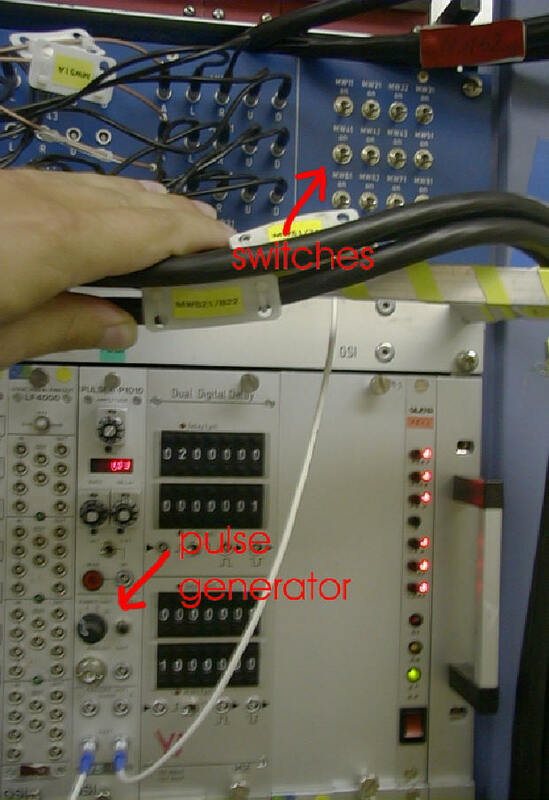 From the pulse generator (see picture) the pulse can be distributed to all MWPCs with the many switches. Only cathodes can be tested. MW42 has no pulser entrance but one can always put the pulser signal directly to the entrance of a preamplifier channel. To get a trigger signal use the switch "MW pulser" from trigger box 2 and select TB2 in trigger box 1. The factor depends on the delay lines and on the TDC used. Currently it is 0.0732 mm/channel (4.0ns/2mm delays, 1200ns range for 4096 TDC channels). The offsets are close to zero. The factor and offset are set in the online analysis program (setup.C for GO4). There also the cut window on the sum peak has to be defined to clean the spectrum. In the focal planes with two MWPCs the angle can be measured as well, tan(α) = (x2 - x1) / distance. Offset calibration can be achieved by one of two methods: The easier one is to use the pulser signal - which is fed to the middle of the delay line, to obtain the electronic centre of the detector. The source of error here is that the detectors are only aligned with an accuracy of about ±1 mm relative to the beam line. Another method is to align the primary beam with the current grids. Then the beam current is decreased to several hundred particles per spill and observed with the MWPCs. The offset is then determined by taking the mean value of the resulting spectrum. In case the slits are close to the MWPCs one can use the step motor position for calibration. The detectors operate with a mixture of argon, CO2 and a little alcohol at atmospheric pressure. The gas flow can be controlled independently for the four focal planes S1 through S4 and is set to roughly 5 l/hour. Before the detectors can be used, gas flow has to be provided for at least 12 hours. The GSI detector laboratory (Dr. C.J. Schmidt, Mr. Michael Träger (Tel. 2639)) takes care of the gas supply unit and has to be informed in advance. 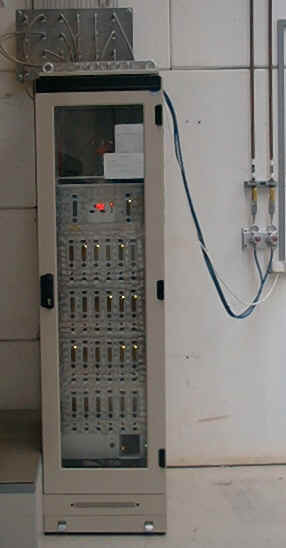 The gas flow is controlled, mixed and monitored from the cupboard in front of the cave entrance, see picture. Herbert Stelzer, "Multiwire chambers with a two-stage gas amplification", Nucl. Instr. and Meth. A310 (1991) 103. Mathias Steiner, Diplomarbeit, Institut für Kernphysik, TH Darmstadt 1991. Bernd Voss, Diplomarbeit, Institut für Kernphysik, TH Darmstadt 1989.